11.19: Mohanlal announces that Sabumon is the winner of Bigg Boss Season one. He handed over the trophy to Sabumon, while Dr CJ Roy of Confident group gives a flat worth one crore to Sabumon Abdusamad. 11.09: Mohanlal invites Asianet MD Madhavan to the Asianet floor. Madhavan revealed that Bigg Boss is the biggest reality show that Malayalam television industry has ever witnessed. 11.08: Lijo Jose Pallissery reveals that Sabumon will be playing the role of a buffalo hunter in this upcoming film. 11.05: Sabumon and Pearle Maaney enter the floor with Mohanlal. 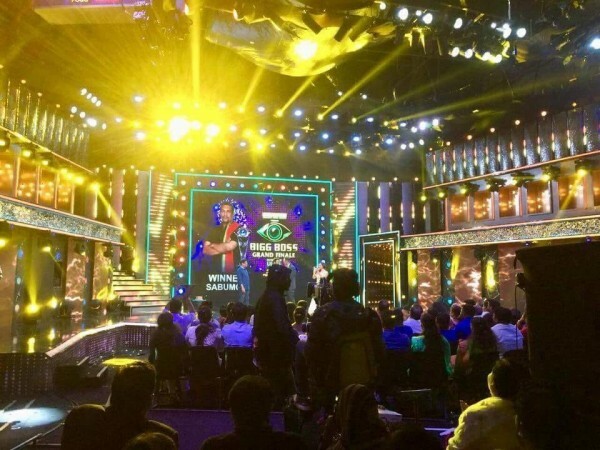 Audiences welcome the final two contestants of Bigg Boss Malayalam with a loud applause. Pearle says the audiences that she is having a different feeling now. Sabumon reveals that he is quite happy to enter the final. Lijo Jose Pallisserry and Vijay Babu enter the floor. Vijay Babu reveals that he has hired Sabumon Abdusamad for a new movie named 'Jallikettu' which is being directed by Lijo. 10.59: Mohanlal now takes Sabumon and Pearle out of the Bigg Boss house. Mohanlal asks the game authorities to turn off the lights inside the Bigg Boss house. 10.56: Mohanlal now walks through the Bigg Boss house. Sabumon shows the cots where they slept. The Bigg Boss host now visits the kitchen and dining hall. 10.55: Mohanlal now enters the Bigg Boss house. He talks with Pearle Maaney and Sabumon Abdusamad. The Superstar informs the duo that they are going to leave the house. 10.50: Bigg Boss now thanks Malayali audiences for making the show a big success. Sabumon and Pearle Maaney eagerly waits for the much-anticipated result. Bigg Boss reveals that both of them are exiting the house forever. 10.45: Mohanlal is all set to announce the final elimination which will determine the winner of Bigg Boss Malayalam. 10.43: Mohanlal now calls Ranjini Haridas and Anoop Chandran to the floor. The Superstar now gives Anoop Chandran's 'Kolambi' to Ranjini Haridas. 10.36: The Superstar now shows the recap of Adholokam (Underworld) activities in the Bigg Boss house. Mohanlal is back on the floor, and he now shows the letters Asianet received detailing feedback about the Bigg Boss show. The Superstar takes one letter and reads. 10.20: Mohanlal is back after the break. He now starts talking about romantic affairs between men and women. As per Mohanlal, the world is so much beautiful just because of the romance between two opposite sexes. He now shows a video depicting the romantic affair between Pearle Maaney and Srinish Aravind. 10.10: Mohanlal informs Pearle and Sabumon that Shiyas has been eliminated from the house. The Superstar asks them to wait for some more time to know the real winner. 10.01: Shiyas says that Srinish is the gift he got from the Bigg Boss house. Mohanlal now shows the video of Shiyas' days in the show. Shiyas informs Mohanlal that he will try for more chances in cinema once he gets out of the house. Thus Shiyas became the second runnerup of Bigg Boss Malayalam, season one. 09.59: Shiyas is now in the activity room. Bigg Boss reveals that Shiyas is out of the house. Shiyas leaves the house through the door. Mohanlal invites Shiyas to the floor. The Superstar lauds Shiyas for his brilliant performance inside the house. Shiyas reveals that he really wished to win the contest. As per Shiyas, Sabumon is like his brother, and Pearle is like his sister. 09.53: Bigg Boss asks Sabumon to come to the activity room. From the activity room, he watches the recap of his 100 days in the Bigg Boss house. 09.48: Mohanlal now gears up with the third eviction. The camera now zooms into the house. Bigg Boss announces that the third elimination will be made in another few minutes. Pearle now watches her days in Bigg Boss. 09.41: Mohanlal now shows a recap video which shows the best friends inside the Bigg Boss Malayalam house. 09.16: The camera once again zooms into the house. 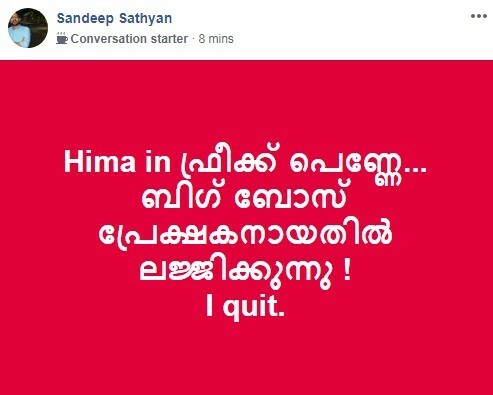 Shiyas now shares his disappointment about Srinish's eviction. He reveals that Srinish was the only one person whom he can trust in the house. 09.01: Mohanlal calls Srinish to the floor. After having a casual talk with Srinish, Mohanlal starts singing a song praising Malayalam language. 08.53: Mohanlal asks the contestants to stand up. He asks who wishes to come out of the house. Shiyas says he is ready to go out of the house now. Sabumon also expresses his willingness to go out of the Bigg Boss house. Mohanlal asked Srinish whether he wants to come out of the house. The Superstar reveals that Srinish is out of the house. 08.50: Mohanlal reveals that a total of five crore votes were polled during the season. The Superstar now starts talking with the four remaining finalists. 08.42: The camera now zooms into the Bigg Boss Malayalam house. Pearle Maaney and Srinish can be seen hugging each other. Pearle cries and Srinish tries to console her. Pearle asks Sabumon to support her romantic affair with Srinish. Sabumon tells Pearle that her mother may oppose her decision to get married to Srinish. 08.33: Stephen Devassy and crew performs a musical show for Bigg Boss audiences. Mohanlal philosophically talks about Kerala and its beauty. He says that Kerala is God's own country. The Superstar now starts singing praising the beauty of India. Social media users are not sparing Mohanlal too. Hinting the singing failure of Mohanlal in Lalism, they starts trolling the Superstar. 08.25: Mohanlal is back on stage after the break. He now invites Siya Sana and Anjali Ameer to the floor. Diya Sana performs dance moves on the stage. Anjali Ameer too joins her on the floor. The Superstar now asks Anoop to come to the stage. Basheer Bashi, David John and Manoj Varma too enter the floor. 08.23: The camera now zooms into the house, and we can see Shiyas Kareem watering the plants. Pearle says everyone that she could not enjoy the freedom of cooking while inside her house. 08.21: Hima Shankar enters the floor, and she shares experiences of her Himalayan trip to Mohanlal. Hima's funny dance moves too rack up trolls from social media platforms. 08:15: Archana Suseelan now enters the stage with some power packed dance moves. She tells Mohanlal that days in Bigg Boss were the most memorable in her life. 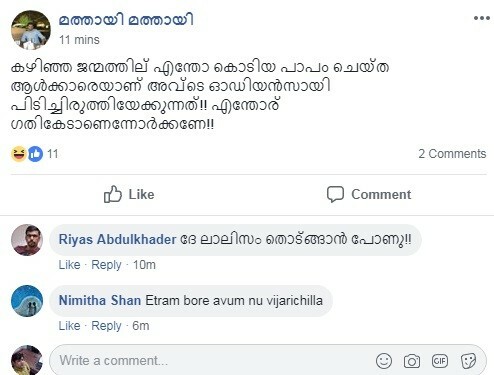 08:13: As Asianet showed the comedy skit, social media users in Facebook pages like 'Bigg Boss Malayalam' fans start trolling the organizers for showing unwanted substandard skits in between the most anticipated show. 08.03: A comedy skit now going on in the stage. The skit literally trolls Mohanlal and other Bigg Boss contestants. The comedy skit shows the finalists of Bigg Boss Malayalam as yesteryear Mollywood actors; Prem Nazir (Srinish), Sheela (Pearle Maaney), Jayan (Shiyas), Thikkurissi Sukumaran Nair (Aristo Suresh), and Jose Prakash (Sabumon Abdusamad). 07.57: Mohanlal now gives a surprise to Aristo Suresh. He invites renowned filmmaker Rajeev Kumar to the stage. Rajeev Kumar reveals that Aristo Suresh is going to play a crucial role in his upcoming movie 'Kolambi'. 7:50 pm: Suresh says Mohanlal that he is very much in love with the Bigg Boss Malayalam house. Mohanlal informs Suresh that he is an accomplished man as he spent 100 days in the house successfully. 7:46 pm: The final elimination happens. Mohanlal now talks about Aristo Suresh, and shows a video of Suresh's days in the Bigg Boss house. Aristo Suresh enters the floor with Mohanlal. It is confirmed. He is out from the race. 7:36 pm: Mohanlal now calls in Ranjini Haridas to the stage. She enters the stage with a scintillating dance performance. As per Mohanlal, Ranjini Haridas was one of the most active contestants inside the house, even though she was eliminated midway. 7:30 pm: Mohanlal now invites Aditi, the unexpectedly evicted contestant to the stage. It should be noted that Aditi was one among the finalists after last week's nomination. However, she was evicted from the house unexpectedly on last Wednesday. Mohanlal reveals that Aditi was eliminated midway, as the votes she received was pretty low when compared to other finalists. Mohanlal now shows Aditi's days inside the Bigg Boss house. Aditi says she loves Mohanlal very much. 7:29 pm: The Bigg Boss anchor says that the contestant who received less votes will be eliminated now. Aristo Suresh is eliminated from the house. Sabumon kisses Suresh on his hands. 7:26 pm: Suresh says that he is a little hesitant to leave the house. Mohanlal reveals that Bigg Boss is actually awaiting to start the second edition after completing the first season. Mohanlal once again says that big games are being played inside Bigg Boss Malayalam house. The Superstar reveals that he is going to eliminate one by one after analyzing the audience poll. 7:25 pm: Mohanlal also starts singing Bigg Boss Malayalam theme song with Stephen Devassy. Evicted contestants who are present in the stage start dancing. Mohanlal now talks starting to the finalists of Bigg Boss Malayalam. He says that every contestant has dressed in a very stylish manner. Suresh now sings a song upon Mohanlal's request. Mohanlal asks finalists to stand up. 7.20 Mohanlal is back again on the stage. The Superstar says that Stephen Devassy is slowly emerging as an International icon. He invites Stephen to the stage. The 'Odiyan' star says that Stephen is a real genius in the world of music. Stephen Devassy starts his performance. 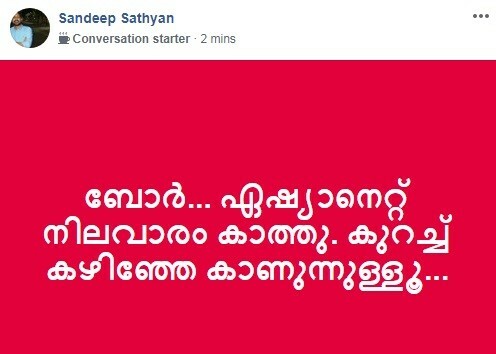 He also requests Mohanlal to join him in the dais. 7.15 pm: We can see musician Stephen Devassy entering the Bigg Boss house. All the audiences were seen dancing along with the charismatic musician. Sabumon along with the other housemates invite Stephen Devassy to have a tea. Pearle says Stephen Devassy that this will be their last day inside the Bigg Boss house. Devassy conveys his wishes to all the finalists. Stephen Devassy leaves the house. 7.10 pm: As usual, Mohanlal starts his philosophical talks. The Superstar says that people who struggle will finally emerge as the winners. As per Mohanlal, it is the duty of everyone to do self-criticism, and he adds that it will help them to become better individuals. Mohanlal reveals that more than 4 crore votes were polled to determine the winner of Bigg Boss Malayalam, season one. 7.09 pm: A spectacular dance performance with the song 'Muruga Muruga' from the movie 'Pulimurugan' is now showing in the stage. As the dance continues, Superstar Mohanlal enters the stage, and he too shakes his hip with the dancers for a while. 7.07 pm: Mohanlal makes his grand entry to Bigg Boss. He is seen wearing an elegant blue coat. He enters the scene with the iconic background score of Tamil movie 'Jilla'. Asianet now shows Bigg Boss viewers comments. Many viewers were seen asking why Ranjini Haridas was eliminated from the house? Another viewer asks whether cell phones were being provided to the housemates. 7.05 pm: The curtain raiser of the finale begins. Asianet now shows the promo of Bigg Boss. A recap of these 100 days is now being shown. The show authorities reveal that the contest is now going to end today. Bigg Boss congratulates the five contestants--Pearle Maaney, Sabumon Abdusamad, Srinish, Shiyas and Suresh for entering the finals. September 30 will mark the end of Bigg Boss Malayalam first season, and Mohanlal, the host of the show will reveal the name of the winner in the grand finale which begins at 7 PM IST. As per the latest statistics, a neck and neck competition is going on between Pearle Maaney and Sabumon Abdusamad. Sources close to the show informed IBT India that both of them have racked up an almost equal number of votes. It should be noted that the audience poll which determines the winners of Bigg Boss ended on yesterday night at 12 AM. Asianet and Endemol have already finalized the winners, and it takes only a matter of time to find out the name of the person who tastes the ultimate glory. Shiyas touted to be the black horse among the finalists is expected to finish as the second runner-up during the finale. 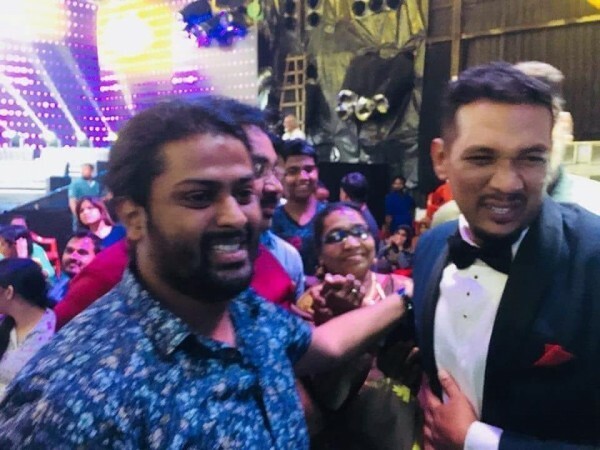 Even though the sympathy factor is working in his favour, his fanbase is not as strong as Pearle Maaney or Sabumon Abdusamad. Suresh and Srinish are expected to finish the race in the fourth and the fifth positions respectively. All the evicted contestants of Bigg Boss Malayalam except Swetha Menon and Sreelakshmi will attend the extravagant finale which will be conducted today. The evicted contestants entered the Bigg Boss house for the last time yesterday, and they had conveyed their wishes to the finalists.